New Orleans is a city where sensory overload can easily occur. The delicious smell of Po�Boy sandwiches fill the air, a cuisine that can pretty much be found only in Louisiana. The smooth, smoky sounds of jazz roll gently out of the open air bars that fill the French Quarter. Warm Beignets, New Orleans most famous treat, dissolve and melt on the tongue. In no other city in the United States can all of these wonderful things be found and at the same time. New Orleans, the Big Easy, has long been one of the most unique and colorful cities in the country. There is something here for everyone, both young and old. New Orleans� uniqueness can be felt the moment one steps foot in the city. It hangs in the air. 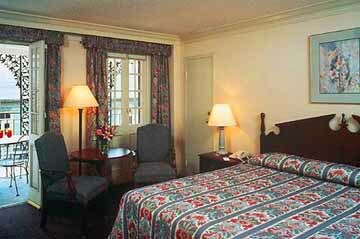 Located smack dab in the middle of it all is the Ramada Plaza Hotel, more commonly referred to as the Inn on Bourbon. Located on the corner of world famous Bourbon and Toulouse Streets, the Inn on Bourbon provides their guests with all of the modern day conveniences while immersing them in Old World charm. The Inn on Bourbon sits on the sight of the Old French Opera House which was the first of its kind in the states. The hotel is conveniently located near many of New Orleans most popular destinations including Jackson Square, Canal Street, the Aquarium of the Americas, the Mississippi River and Jax Brewery. Without these places New Orleans would be a typical American town. 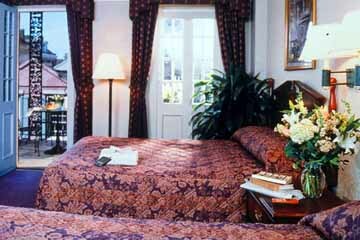 The Ramada Plaza Hotel in New Orleans boasts 186 elegantly appointed guest rooms. Each accommodation has recently been renovated and individually refurbished in a stately, yet comfortable fashion. The majority of the guest rooms have the added bonus of a private balcony. The balconies either overlook Bourbon Street, Toulouse Street, or the Inn on Bourbon�s exquisite French Quarter Courtyard which is also the location of the hotel�s swimming pool. These balconies are the ideal spot to watch the comings and goings of the Quarter, especially during Mardi Gras or the plethora of parades that always seem to be taking place in the Big Easy. Guests may request either two full size beds or one king size bed in their room depending on the number of people they need to sleep. The spacious accommodations offer all of the modern day amenities that world savvy travelers have come to expect from high-end hotels. Each accommodation is equipped with a remote controlled color cable television with on-command and pay-per-view movies. The HBO channel is provided free of charge. To guarantee maximum comfort for all guests, each guest room is individually climate controlled. Travelers can keep in touch with the real world and surf the information highway by using the telephone data ports to hook-up to their laptops. The telephones also feature private voice mail. Other in-room amenities include coffee maker, iron, ironing board, mini-bar, radio alarm clock and hairdryer. Refrigerators are available for a small fee as are roll-away beds. Baby cribs are available for no additional charge. Guests� valuables may be stored in the in-room safes for a daily fee of a dollar fifty. Handicap accessible rooms are available upon request. Check-in is at 4:00 pm and guests must check-out of the hotel on the day of departure by noon. The courteous and professional staff at the Inn on Bourbon takes immense pride in providing their guests with five-star services. Although the Ramada Plaza Hotel is quaint in comparison with many of the city�s more �modern� accommodations, the services easily match, if not surpass, those offered at larger, more impersonal hotels. 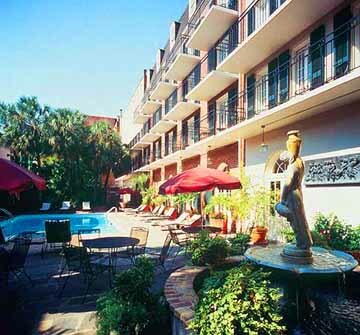 The most outstanding feature of the Inn on Bourbon is the beautifully manicured courtyard. Lush foliage surrounds the swimming pool. During the warmer months this is a wonderful spot to catch some rays while it�s ideal any time of year to sit and enjoy a refreshing frozen concoction. Workout buffs will be pleased to discover that just because they are away from home, there is no need to stray from their exercise routine as the hotel houses its own fitness facility. The fitness area features state-of-the-art workout equipment. The staff at the Ramada Plaza Hotel is multi-lingual, ensuring that communication is never a problem. The concierge is the person to see if assistance is needed in finding New Orleans� hidden gems. The concierge will also be more than happy to help secure dinner reservations at any of the city�s fine dining establishments or even get tickets to the theater. For those who are in town for business purposes, the Inn on Bourbon has its own business center as well as fax and copy services at the front desk. Guests can enjoy a complimentary cup of tea or coffee in the lobby 24 hours a day while reading the local newspapers provided by the hotel. Other guest services include room service, valet parking, housekeeping, laundry and express check-out. The Inn on Bourbon is also home to three boutique stores. Travelers can take home a New Orleans� keepsake from the Bayou Threads Gift Shop. The Bourbon Street Gallery sells European artwork and Elegant Illusions Copy Jewels is the place to go for the tennis bracelet that you�ve always coveted, but could never afford. The Bourbon Street Caf�, with it�s delicious coffees and mouth watering baked goods, is a wonderful place to enjoy breakfast and kick start your day. The caf� also has an American-style buffet. After a day spent exploring the Big Easy, unwind with a cocktail in the Lobby Bar. The Ramada Plaza Hotel also has an ample amount of meeting space. The inn�s catering staff will be more than happy to take care of all your dining needs. 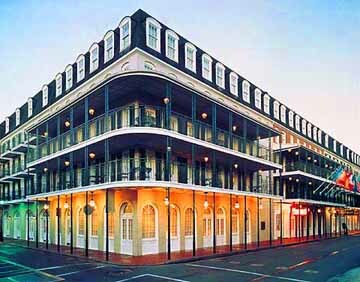 The Ramada Plaza Hotel, also known as the Inn on Bourbon, is located at 541 Bourbon Street in the heart of the French Quarter at the corner of Bourbon and Toulouse Streets. This modern day hotel exudes Southern charm and is in walking distance of many of the city�s most famous attractions including fine dining, jazz clubs and shopping.